Paragon Firefly electric Kiln for glass, PMC, porcelain firings. The Firefly is supplied with an advanced Sentry 4 Express computer controller, allowing you complete control over each firing. Use the preset firings, or enter your own. The portable and convenient FireFly will give you unbridled freedom. It plugs in almost anywhere on a household 13amp supply. You will never outgrow a small kiln. If you later buy a larger kiln, continue to use the small one for testing or small projects. Perfect a new design in the small kiln before running larger production quantities in the large kiln. A small test kiln is invaluable in solving ceramic glaze problems. The heat of the kiln is magical and offers wonderful surprises. Stained glass, enamels, and ceramic glazes undergo a complete transformation in the kiln. Opening a kiln to view your treasures is a festive moment that you will never outgrow. The firing results will amaze you. Create unique glass bracelets and pendants in the 20cm square x 11.5cm high interior. Fire small glass casting molds and even glass drop moulds. Do not feel this is a kiln limited to glass. Try firing porcelain or stoneware pendants and beads, the high firing temperatures is no problem for this little kiln. The kiln has plenty of power on its 13amp supply to blast up to 1287C, now that's real hot for a kiln of this size! The Paragon FireFly is an excellent choice for beginners. Firing rapidly, yet completely controllable to a ramp of your choosing. The pilot light glows brightly during firing. The Paragon FireFly is made of durable 2 ½" thick insulating firebrick, which stores heat for slow cooling and safe annealing of smaller glass projects. The solid 2 ½" thick firebrick top and bottom help seal in the heat. To strengthen the firing chamber, the firebrick corners are fitted together with L-shaped notches. This type of joint lasts longer than the butted joint and the "picture frame" mitered joint found on other brands. Dropped and recessed grooves protect the replaceable heating elements for a longer life. Wires are fastened to the elements with heat-dissipating connectors refined and proven over many years in our kilns. Rugged construction makes this kiln a long lasting little workhorse. This kiln is built to last. Elements are coiled from the finest high-temperature wire available. The hinged lid is self adjusting to compensate for expansion at higher temperatures. The hinge includes a stop that holds the lid open and out of the way. A builtin 3" tall steel base with mar-proof rubber feet covers the entire firebrick bottom. 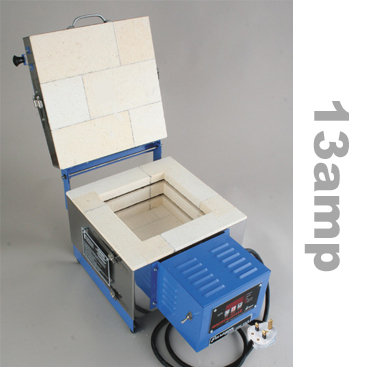 Fire the kiln directly onto a heat resistant work surface, no extra stand is needed. A stainless steel heat shield inside the switch box protects wiring from contact with the case. Costly nickel-plated copper wiring is covered with high temperature glass-braided insulation. Louvers on the top, side, and bottom of the switch box circulate air for the long life of the electrical components while keeping dust inside the box to a minimum. This kiln comes with a 1 year warranty, 2 years on the computer, and our help and advice for as long as you need it!